Huw Edwards introduces live coverage of this world-renowned military parade to mark the official ninetieth birthday of HM the Queen. 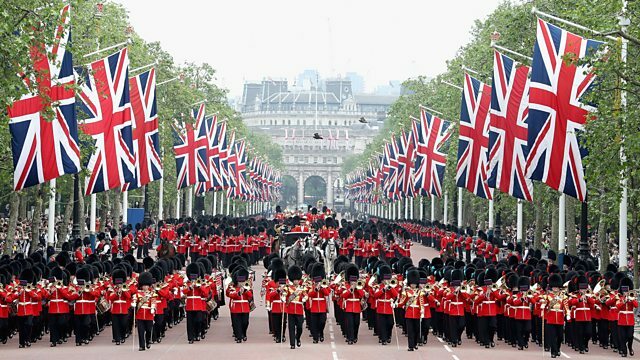 Huw Edwards introduces live coverage of this world-renowned military parade to mark the official ninetieth birthday of HM the Queen, from the glorious surroundings of St James's Park in London. This year the Colour of 1st Battalion Coldstream Guards are trooped on Horse Guards Parade in front of thousands of spectators. After the parade, celebrations for the Queen's birthday continue at Buckingham Palace with the famous balcony appearance and flypast. A weekend of celebrations marking HM the Queen's ninetieth birthday.